Let's do it again... like it's the FIRST time! 8PM ($10) - Movie and Door Prizes! 11PM ($15) - Costume Contest and Door Prizes! 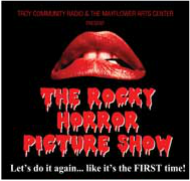 Bundle your RHPS ticket with Ghost Tours of Troy! Click for details! Audience participation is encouraged! See Rules for Participation.